Does your client's working life interfere with their leisure time? If they are the sort of person who takes their job responsibilities home with them and just cannot rid themselves of thoughts about what went on during the day then, while they can be admired for their conscientiousness, the stress of this can damage their health, relationships and their enjoyment of pleasurable pursuits.
. The adage "All work and no play makes Jack a dull boy" springs to mind. Your client's partner or family probably aren't anywhere near as concerned about those outstanding tasks or who said what to whom in the office, shop or factory as they are so perhaps it's time to deal with those Work Worries once and for all. 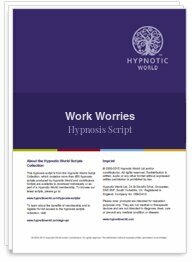 This professional hypnotic script can help your clients to do just that - leave work concerns where they belong. If there is something that is really pressing then this script also allows for that, however, in the main they should be able to enjoy a new and happier balance in life. Download this Work Worries script today and give your clients a chance to really start enjoying their own life.